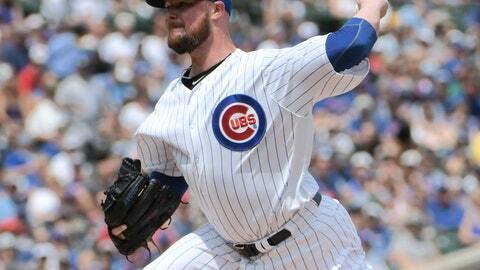 CHICAGO (AP) — Jon Lester offered no clues. When it comes to his mid-summer swoon, there’s only one thing for the veteran left-hander to do. Lester was hit hard again and the San Diego Padres also battered Chicago’s bullpen on their way to a 10-6 victory over the Cubs on Sunday. Cory Spangenberg put San Diego ahead to stay with a tiebreaking double off Carl Edwards Jr. (3-2) with two outs in the eighth inning. Hunter Renfroe hit a two-run homer and Travis Jankowski added a two-run single in the Padres’ four-run ninth against Randy Rosario. Renfroe finished with three RBIs, helping the last-place Padres salvage a split of the four-game series after they blew a 5-1 lead in the finale. “It was one of our most team-oriented wins we’ve had all year where everybody did something positive for us,” manager Andy Green said. Spangenberg and Jankowski were inserted into the game as defensive replacements in the seventh inning. Craig Stammen (5-1) got the win despite allowing pinch-hitter Anthony Rizzo’s tying single. Lester was tagged for five runs and eight hits in five innings. The All-Star left-hander was 10-2 with a 2.18 ERA after beating the Dodgers on June 26, but has a 6.81 ERA in seven starts since that win in Los Angeles. One of the biggest problems for Lester has been the long ball, and it hurt him again on Sunday. Freddy Galvis golfed a leadoff drive just over the wall in left in the second, and Franmil Reyes opened the fourth with a massive shot to center that traveled an estimated 477 feet for baseball’s fifth-longest homer this season, according to Statcast. The 34-year-old Lester has allowed at least one homer in each of his last seven starts. Getting him back on track could be the biggest key for Chicago as it tries to hold off Milwaukee in the NL Central. “Just got to be better,” Lester said. San Diego also got a two-run triple from Eric Hosmer with two outs in the second. Joey Lucchesi struck out nine in 5 2/3 innings after his start was pushed back a day due to a bout with food poisoning. Javier Baez hit his career-best 24th homer and an RBI double for Chicago, which won five of seven in the season series against San Diego. Ben Zobrist added two hits after beginning the game on the bench, including his eighth homer. Rizzo came up again with a runner on first in the ninth and struck out looking on a pitch that appeared to be outside , ending the game. Rizzo then had a long conversation with plate umpire Angel Hernandez before leaving the field. San Diego lost right-handers Tyson Ross and Jordan Lyles on waiver claims. Ross was picked up by St. Louis, and Lyles was claimed by Milwaukee. Right-hander Trey Wingenter was promoted from Triple-A El Paso. Green said right-hander Brett Kennedy will come up from the minors to start Wednesday against the Brewers in his major league debut. The 24-year-old Kennedy is 10-0 with a 2.72 ERA in 16 starts for El Paso. Cubs: Maddon said RHP Yu Darvish (triceps and elbow injuries) felt good after throwing 55 pitches in a bullpen session Saturday. “We’re in the process of talking about what we’re going to do with him in Kansas City,” Maddon said. Padres: Following an off day, LHP Clayton Richard (7-10, 4.99 ERA) faces Brewers RHP Chase Anderson (7-7, 3.65 ERA) in the opener of a three-game set at Milwaukee. Richard is 0-4 with a 7.05 ERA in his last seven starts. Cubs: LHP Cole Hamels (6-9, 4.53 ERA) starts the opener of a three-game series at Kansas City on Monday night. It will be Hamels’ second start since he was acquired in a July 27 trade with Texas. RHP Jakob Junis (6-11, 5.12 ERA) pitches for the Royals.